The high tech Visiobike e-bike! The Visiobike e-bike is high tech. Here’s why: Google Glass integration, serious smartphone integration, rear view camera, carbon fiber frame, integrated Panasonic lithium battery in the frame, MPF mid drive motor, auto shifting NuVinci H|Sync continuously variable hub, Gates belt drive, & more! Whoa! Checkout the retro style Cykno electric bike with a carbon fiber frame, fork, wheels, brake levers. 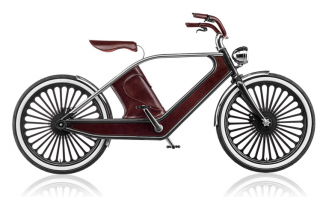 The Cykno also features a mid drive motor, 360 watt hour lithium polymer battery, and pedal assist (pedelec). No word on price yet, but I bet it ain’t cheap! The new HeroEco A2B bikes were presented at a launch event in New York City recently. Here is a report from an author of TechCrunch about his experience with the new A2B. And here is some news about their recent launch event in Munich.